Cream butter and cream cheese with mixer. Add sugar one cup at a time while mixing. Mix in vanilla extract. Fold in coconut with a spoon and stir well. Scoop out about a tablespoon of the mixture at a time and place on cookie sheet covered with parchment paper or wax paper. My pieces make about two bites each. Place the cookie sheet in the freezer for 30 minutes. Sprinkle your cinnamon in a shallow pan. (I use a metal pie pan!) Remove the candy from the freezer and roll each piece in the ground cinnamon. Coat lightly, just enough to cover. The small cupcake paper liners are wonderful for this candy. This makes about 25 pieces of candy. Keep refrigerated. Enjoy! Note: If using cocoa instead of cinnamon, use about the same amount and coat the same way. 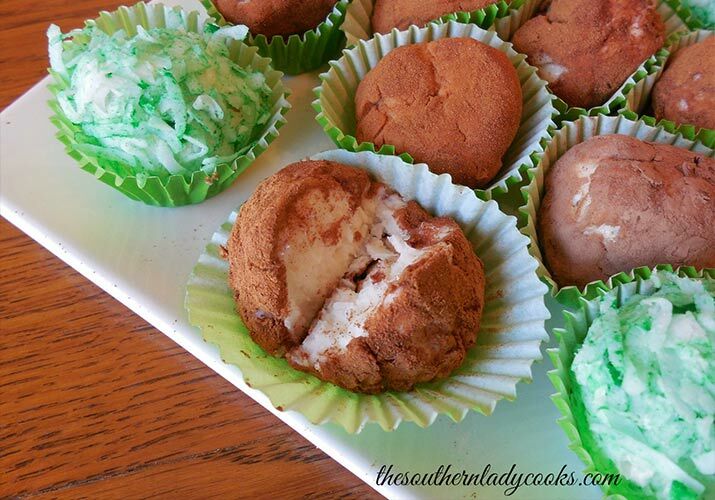 If using coconut, put a cup of coconut and add a drop of green food coloring until you get the color you like.